I say this all the time, but I truly believe that the key to a great veggie meal (or any meal, really) is a great sauce! 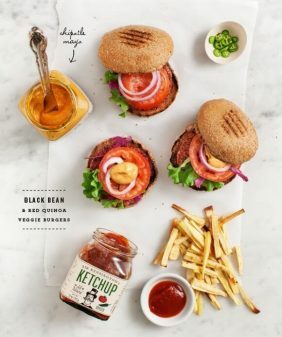 With a great sauce on hand, you can use whatever veggies/grains/proteins you have to easily make salads, bowls, tacos, or sandwiches any night of the week. This smoky, creamy chipotle sauce is one of my absolute favorites to punch up any meal. It started as a sauce to the cauliflower tacos in my first cookbook and now I love it on everything from burrito bowls to breakfast tacos. It’s also great as a sweet potato fries dipping sauce, as it’s pictured here today. 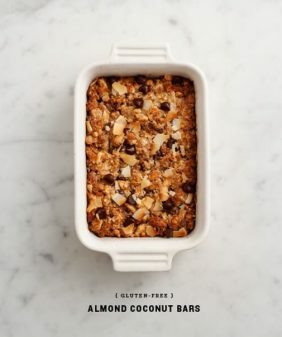 Keep reading for how to make it (and yes, there’s a vegan version!). What’s the secret to making a great chipotle mayo? Canned chipotle peppers in adobo sauce. 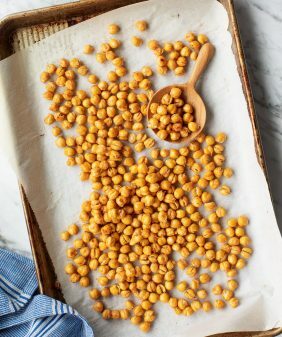 They have an amazing smoky, spicy flavor that makes them one of my go-to ingredients in savory recipes. If you’ve never used chipotles in adobo, don’t worry – they’re not hard to find. Most grocery stores carry them in the Mexican aisle. After you make this recipe, use your leftover chipotles in BBQ jackfruit sliders or creamy vegan nacho cheese! 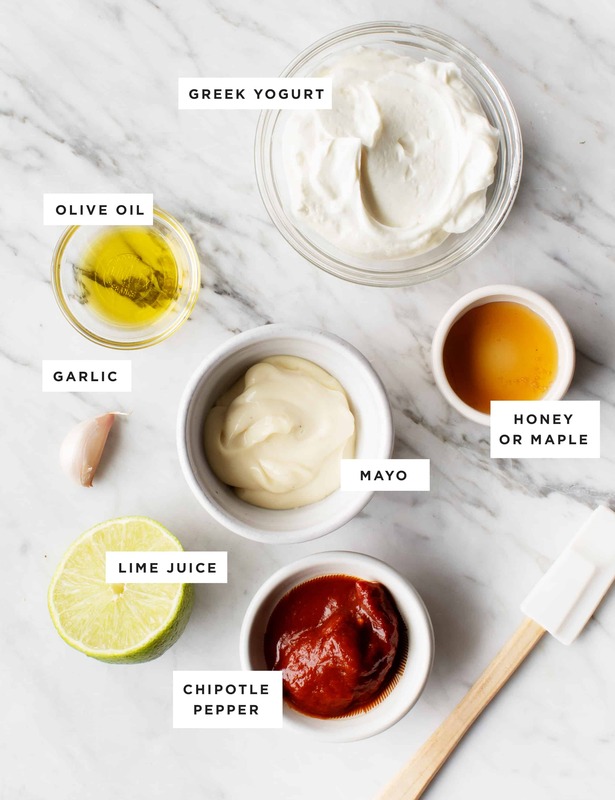 In this recipe, I balance the heat of the chipotles with sweetness from honey, richness from Greek yogurt & mayonnaise, and brightness from lime to make an addictive sauce that’s a bit lighter than a traditional chipotle aioli. And no need to worry if you’re vegan – maple syrup and vegan mayo work perfectly in place of the honey, yogurt, and traditional mayonnaise. Ok, you’ve made your chipotle sauce. Now what do you do with it? 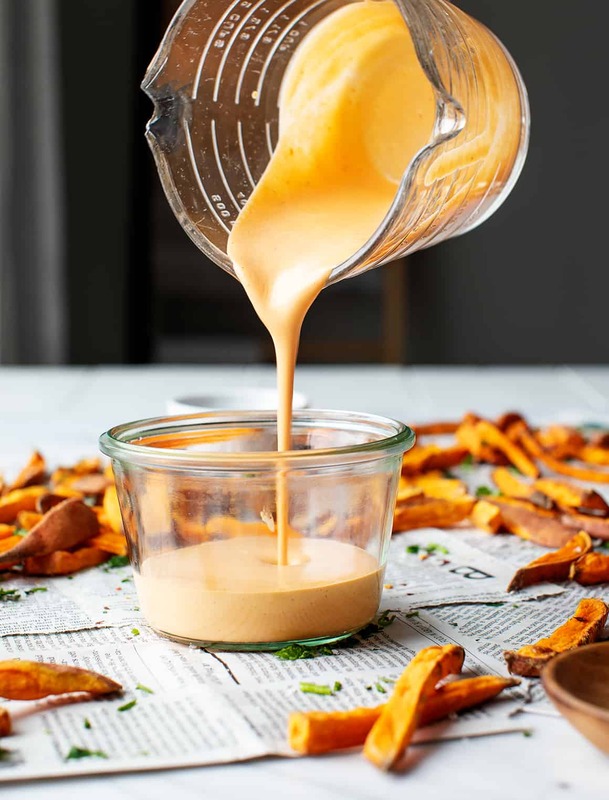 I love to use it as a sweet potato fries dipping sauce, and it’s great to have on hand for quick no-recipe meals. Drizzle it over a burrito bowl or roasted veggies, or dollop it onto tacos like the cauliflower tacos in our first book! 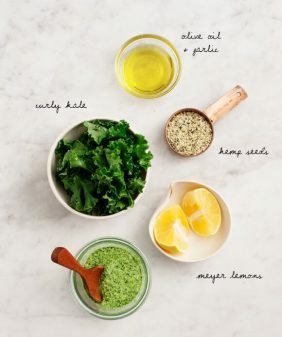 You could also slather it onto a sandwich or use it to top your favorite veggie burger. This easy, smoky chipotle sauce is a great condiment to keep on hand! Use it to spice up your favorite tacos & bowls or as a dip for sweet potato fries. 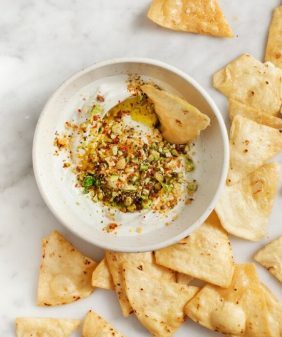 In a food processor, place the yogurt, mayo, chipotle pepper, garlic, lime juice, olive oil, honey, and generous pinches of salt and freshly ground black pepper and blend until smooth. Season to taste with more salt and pepper, if desired. *Vegan option: use ¾ cup vegan mayo instead of the yogurt and regular mayo. This recipe was tested with Sir Kensington's Fabanaise. Use maple syrup in place of the honey. 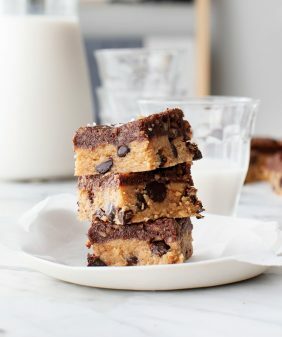 This looks delicious and so easy to make. How long does it keep in the fridge? Hi Amber, up to a week! YUM!! This sauce sounds wonderful! I already know where I would use it – on the magic sausage supper (sausages with veggies & sweet potatoes or butternut squash, baked). I’m making that dish tonight, but have already planned to use a different sauce. I am not a fan of chipotles in adobo, so I will sub a scant half teaspoon of chipotle powder. Definitely want to make this. Hi Susan, I hope you enjoy it! The sauce looks delicious. I haven’t made it before, but it does look like something I’d like to try. This was very easy for me to follow and understand, nice work! This looks creamy and amazing! Have you every used this sauce as a binder for anything? I’m just picturing it holding together “crab cakes” or veggie burgers…and tasting DELICIOUS! Hi Ashley, oh, I think it would be delicious mixed in with veggie burgers!